CryptoSlots.com, a new online casino for players who enjoy the benefits of cryptocurrency gaming, is adding a video poker classic to its collection of unique slots and video poker games. The new Jacks or Better Multi-Hand video poker game joins five other video poker games: Aces and Eights, All American, Double Bonus Poker, Joker Wild and a single-hand version of Jacks or Better. Until September 16th, the cryptocurrency casino is adding 25% to players’ deposits. CryptoSlots.com, a new online casino for players who enjoy the benefits of cryptocurrency gaming, is adding a video poker classic to its collection of unique slots and video poker games. The new Jacks or Better Multi-Hand video poker game joins five other video poker games: Aces and Eights, All American, Double Bonus Poker, Joker Wild and a single-hand version of Jacks or Better. Until September 16th, the cryptocurrency casino is adding 25% to players’ deposits made with Bitcoins, Bitcoin Cash or Litecoins. Video poker players are dealt five cards and can draw up to five new cards to create the best possible poker hand. In this version, players can play up to 5 hands at a time. Sign-up at CryptoSlots.com is simple and requires only an email address. Cryptocurrency deposits and withdrawals are easy and safe and transaction fees are low. Deposits are instantly converted to US dollars for play. Available September 11-16, 2018 only. May be claimed 4X per day. Wagering requirement 35X. 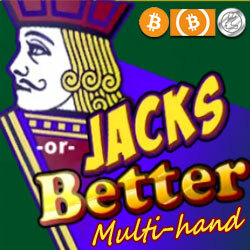 Valid on Jacks or Better Multi-hand only. May be claimed twice per day. Wagering requirement 35X. Valid for all video poker games. CryptoSlots now has 15 provably fair slots (five with high limit versions), six video poker games and one million-dollar jackpot game. (Jackpot Trigger is played with tokens collected while playing other games and can pay up to $1,000,000 on a single spin.) They can be played on any computer, smartphone or tablet.